What is Marshfield Youth Football? Marshfield Youth Football (MYF) is an all-volunteer 501(c)(3), non-profit organization, dedicated to offering a full-contact football program for children in grades 2nd - 8th living in Marshfield, Massachusetts. MYF participates in the Old Colony Youth Football League (OCYFL). MYF is committed to providing a positive football experience for the youth of Marshfield. The OCYFL is local league that has grown from modest beginnings. The league began in 1965 with just 6 teams from around the South Shore of Massachusetts. The OCYFL now includes 22 teams from Southeastern Massachusetts. Teams are split up into 5 divisions based primarily on their K-8 school population. For some of the larger towns the OCYFL added an additional division 6 that allows these towns to play age and grade appropriate football. It is important to note that MYF plays against age, grade and weight based competition. It is mandatory that each player appear for the official weigh-in at the time and date decided by the OCYFL (usually the Saturday after Labor Day) to be eligible to compete during the season. If a player’s weight exceeds the maximum during official weigh-in, the player will be provided the option to move up to the next weight level. After the player makes the weight at the official weigh-in, 1 pound growth allowance is added to the limit each week of the season. Maintenance of weight during the season is monitored prior to each game. Age - No Division 6 Mite player shall attain the age of nine (9) prior to June 1st but must attain the age of seven (7) by September 1st. Grade – A player must be in the 2nd or 3rd grade to be eligible to participate as a D6 Mite. Age - No Division 1 Mite player shall attain the age of ten (10) prior to June 1st. Age - No Division 6 Pee Wee player shall attain the age of eleven (11) prior to June 1st. Grade – A player must be in the 5th grade to be eligible to participate as a D6 Pee Wee. Age - No Division 1 Pee Wee player shall attain the age of twelve (12) prior to June 1st. Age - No Division 6 Midget player shall attain the age of thirteen (13) prior to June 1st. Grade – A player must be in the 7th grade to be eligible to participate as a D6 Midget. MYF provides each player a helmet, shoulder pads, thigh pads, knee pads, practice shirt, practice pants, game shirt and game pants. Player is responsible for his own cleats (molded rubber bottom), girdle with hip and tail pads, athletic supporter/cup, mouth guard with attached tether and any other optional equipment (rib protector, forearm pads, gloves, etc.). MYF equipment distribution days are scheduled prior to the start of the season. Equipment distribution will take place at Stor-It facility, 330 Old Oak Street, Pembroke, MA. There is a refundable deposit check required to receive equipment. The deposit check is held and returned/destroyed upon receipt of the equipment at the end of the season. The MYF website will provide more specific information regarding equipment distribution as the season approaches. According to rules of the OCYFL, the first official practice can be held 30 days prior to the first scheduled game, usually in the middle of August. The first game is usually held on the first Saturday or Sunday after Labor Day. Practices are scheduled 4 to 5 times per week during preseason (before first scheduled game), and 3 times per week during the regular season. There is usually 2 scrimmages scheduled against other towns during preseason. Practices usually run approximately 1 ½ to 2 hours in duration during the evening hours. Coaches will provide you team specific information regarding practice schedules/times. Note: Although we don’t expect parents to make wholesale decisions regarding their vacations and conflicts with preseason youth football, it is important to remember that this is the time that coaches spend on conditioning, evaluating the skills of their players, installing offense, defense, and special teams. MYF is part of the Old Colony Youth Football League which is a competitive league. MYF works hard to keep Varsity level teams competitive but we strive to make football fun for all our players. MYF has never used tryouts or roster cuts as a tool for managing team/roster size. As a way to provide the most playing time possible for each child in our program, MYF has committed to participate in Junior Varsity (JV) games. JV games allow less experienced and/or less developed players to gain game experience to improve their skills and realize the benefits of their participation in practice. This developmental approach is particularly important with the younger players as they are still learning about playing full contact football and can gain valuable experience playing in these games. A player may move between Varsity and JV throughout the season depending on the needs of the team and the abilities of the player. This format gives our players the most opportunity to get playing time and to develop as football players against age and weight matched competition. Game schedules are determined by the OCYFL. MYF fields teams in the OCYFL Division 1 and Division 6. MYF has 3 teams participating in each division (6 total) at the Mite, Pee Wee and Midget levels. The 1st game of the season is usually scheduled the first weekend after Labor Day. Each team plays 8 regular season games and potentially a playoff and championship game. The season is usually completed by the 2nd weekend of November. JV games are usually played on Saturday’s during the regular season. Mites - 8:00am: Midgets – 9:00am: Pee Wees – 10:00am. Note: MYF plays home games at Marshfield High School. Why do we need to register so early? A lot of planning goes into a youth football season but more specifically, the OCYFL request all participating towns to conduct player registrations and reservation dates of their home playing fields, before May 15th of the current year. Head coaches are selected by the MYF board. Interested candidates need to notify the MYF board that they are interested in being a head coach, present an overview of their experience and coaching philosophy. Qualified candidates will be interviewed by the board for the head coach position. After this process is completed, the board will discuss and vote on the candidates. Once a head coach is approved by the board, the head coach will select individuals that they want to be assistant coaches on their staff. All coaches, including assistant coaches, are required to undergo a CORI check. The board takes the selection of coaches very seriously, and tries to make the best choices for the program. The coaches put considerable time and effort into the program, including practice plans, game preparation, as well as numerous staff meetings outside of practice to review strategies and break down game film. You can view a current list of team head coaches by visiting the team contact link on the MYF website. Note: Each year, since its implementation in 2014, all MYF coaches are required to complete the tackle level 1 certification program through USA Football. ​All refund request forms must be submitted to the MYF treasurer. Full refunds will incur an $8.00 processing fee, per child. Deposit refunds will incur a $1.00 processing fee, per child. Request submitted prior to the official OCYFL weigh-in will receive a full refund. Any player unable to participate as a result of a weight disqualification at the official OCYFL weigh-in will receive a full refund. A player who is sick, injured or has a medical condition that does not allow his/her return to participation can request a prorated refund upon submission of medical documentation supporting the players claim that he/she can't return to participation. All medical refund request must be submitted prior to week 5 of the season to be eligible. All refund requests are subject to the return of MYF uniforms and equipment. 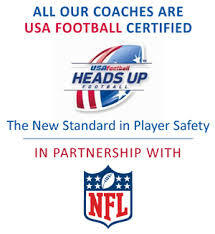 The Heads Up program is USA Football’s national initiative to help make the sport of football better and safer. Introduced in 2012 by the NFL's youth development arm, USA Football, and funded entirely by the NFL, Heads Up is now employed by over 5,500 youth organizations. The program teaches concussion recognition and response, heat and hydration protocols, sudden cardiac arrest, proper equipment fitting instructions, blocking, but its central tenet is the Shoulder Tackling program. When executed properly, Shoulder Tackling literally takes the head out of the game. Players are taught to keep their heads up and lead with their shoulders when tackling. USA Football’s Shoulder Tackling is a step-by-step protocol to teach the core principles of the skill and sets a new standard in player safety. The program utilizes five fundamentals through a series of drills to reinforce proper tackling mechanics and teach players how to properly tackle with a focus on reducing helmet contacts. In 2014, MYF became the first town of the OCYFL to become certified through USA Football's Heads Up program and adopted the Heads Up Football initiatives, including their "Return to Play" program that monitors the return of any athlete who has suffered a concussion. MYF has confirmed the concussion numbers declined over prior years. Since it's the fourth year MYF has implemented this program to closely monitor concussions in an across-the-board effort (grades 2-8), long-term results will be more indicative of its effect on our league.